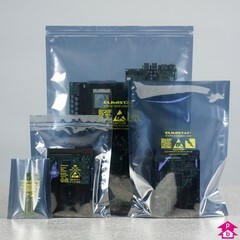 A range of unsealed (open-top) and resealable (grip-seal) static-shielding bags. Whereas anti-static bags prevent the buildup of static charge on their surface, static-shielding bags protect a bag's contents from electric fields by creating a barrier - called a Faraday cage - around them. This is essential when exposing sensitive electronic components to varying electric fields, e.g. when shipping by air or sea. We offer an expanding range of electrostatic discharge (ESD) bags for the handling of products like printed circuit boards (PCBs), quartz and microelectromechanical Systems (MEMS), oscillators and other electronic parts susceptible to static outside an Electrostatic Protected Area (EPA). For non-static-sensitive items (such as nuts and bolts), see our range of pink antistatic bags and liners, which prevent the buildup of static electricity (tribocharging) and are suitable for using in or introducing to an EPA. 8 Products. 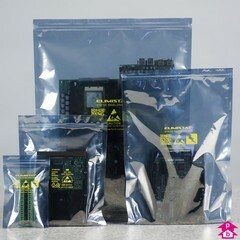 This range includes mini bags for small printed circuit boards (PCBs) to extra large bags ideal when replacing components or stripping down computers. The bags, which can be sealed with ties, tape or a heat sealer, are composed of an internal polyethylene layer, a conductive metallised polyester layer and an external antistatic and abrasion resistant lacquer. These create a Faraday cage around the product which protect the device from direct contact with electrostatic discharge, whilst also stopping the contents of the bag charging up via field induction. The bags have a pre-printed ESD notice and are semi-transparent to help easily identify the contents. Surface resistance of 10^8-10^11. Conforms to MIL-PRF-81705D Type III, EIA 625, EIA 541, ANSI/ESD S-20.20. For items that aren't sensitive to static electricity, see our range of pink antistatic bags and liners, which prevent the buildup of static electricity - also know as tribocharging - and are suitable for use in an Electrostatic Protected Area (EPA). 8 Products. A range of resealable grip-seal static-shielding bags to protect sensitive electronic components from electrostatic discharge (ESD) outside an Electrostatic Protected Area (EPA). Comprehensively tested to exceed industry standards: ANSI/ESD S541, EIA 625 and to be ANSI/ESD S20.20 programme compliant. 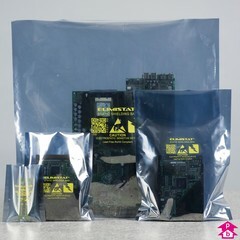 Composed of an internal polyethylene layer, a conductive metallised polyester layer and an external antistatic abrasion-resistant lacquer, these bags create a Faraday cage around the product which carries electricity generated by an electrostatic discharge around the metal bag rather than through it, so expensive components such as printed circuit boards (PCBs) can be protected in transit or storage. These grip-seal bags have a pre-printed ESD notice and are semi-transparent so that their contents can be easily identified. Surface resistance of 10^8-10^11. If packing or storing non-static-sensitive items (such as screws and washers), you may be interested in our range of pink antistatic grip seal bags, which prevent tribocharging and are suitable for introducing to an EPA.